We've recently switched our thermostat from air conditioning to heat. A couple of times since, I've heard this odd, part musical, part moaning sound late at night and tried to determine if it's coming from the furnace. 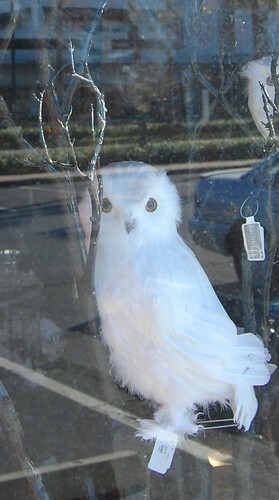 In looking through my photos, I found one of several stuffed owls (cropped to a single owl in the above photo). It occurred to me that maybe what I'm hearing is an owl. Tom said he's seen one recently near The Compound. Of course, now that I want to hear the noise, I haven't heard a damn thing. This window display reminded me of another book I think might be interesting: The Stuffed Owl: An Anthology of Bad Verse. Because, as certain characters in a novel called The Deal could tell you, mocking bad poetry is a good time.